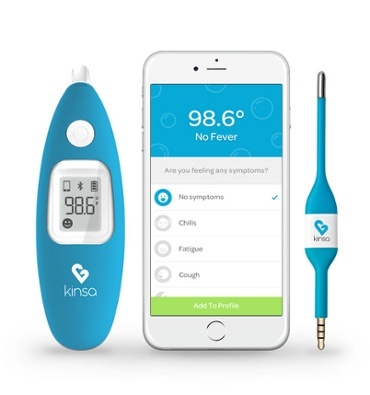 The Kinsa Smart Thermometer requires the use of a downloaded app to your mobile telephone. This is where everything just falls apart. When we first received our thermometer, it looked like your basic thermometer. Good times. Then, we started really looking at it. It came with things that a thermometer ought not to come with. There's a cord that connects to a mobile phone. There's a connector. What? This is disturbing. What if my phone isn't charged, my son is sick and we only have an hour to get a babysitter. We wouldn't even be able to get his temperature before making a decision, because our phone wasn't charged and therefore, wouldn't even turn on. We are entirely too addicted to our telephones. We do not need to acquire anything that increases that dependence. We do not need anything that will not work on its own. Kinsa's mission is to be able to track illnesses before we are affected. Is this doable? Perhaps. Perhaps, not. The very concept feels a little like Big Brother. We do not take favorably to slamming companies and products. In fact, it is normally an apologetic affair, to have to do anything that feels close to such a thing. This review is no different. Everyone that we've dealt with at Kinsa has been great and we are not out for blood. Not in any manner. We simply do not like the fact that we cannot use this nice, new thermometer without a mobile phone.